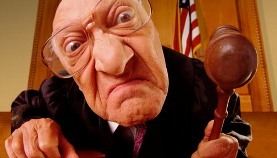 This is part 2 in a series of articles looking at the subject of going to Court. These thoughts are initial ramblings as I toss over issues relevant to the legal system. My thinking will obviously mature in time, but for now follow me as I graze through the matters of facing the Courts. Courts are a mechanism, much like a machine. They are a machine available to all who have the key to activate it on their behalf. Courts cannot go off and make a ruling about someone at their whim. The court is not an independent agent, able to pick up any case it so chooses. The court is locked into a building and must wait until someone comes along with a case they wish the court to address. In that sense the court is quite powerless, waiting like a handmaid for someone to give it orders so it can spring into life and do what it is designed to do. Someone must make a charge or cause a court action to be initiated for the court to proceed with any deliberations. A court cannot send a notice that it decided, arbitrarily, to create a charge or penalty against someone. Officials of the court can’t sit around watching television and then decide they will create a charge against someone they saw being interviewed, or in a news story. There must be “just cause”. The Biblical requirement of “an eye for an eye” sets up the principle of Just Cause. Someone must have suffered some damage in order for the court to have just cause to press for some compensation or other legal response. Even so, the just cause does not come from the court, but from an aggrieved party who engages the court to act on their behalf in the matter. If people are of good will they will discuss and resolve their problems. If one party is not of good will the courts will be asked to arbitrate, because the parties have not been able to come to a happy resolution. However, if the good will party was truly good will, it would allow itself to be aggrieved, suffer loss, as the Apostle Paul advises, and let the matter go, despite the personal impost. Rather than demand our rights we are instructed by Christ to go the extra mile, giving more than was demanded. For those who are locked into the win-lose context in their fight with others, the courts become a form of “rent a bully”. If someone engages the court as their bully they have already revealed that they are not of good will as a follower of Christ. When people feel aggrieved and are unable to resolve their sense of loss and the feelings that spring from that, they can see the legal system as a means of demanding their way, getting the justice they believe they are entitled to and even of hurting the other person by apply the strength of the court against them. Courts were not created to be an ugly element on the social landscape, but sadly, due to the hard hearted attitude of many or personal desire to gain advantage over others the courts have often been nothing more than a bully for hire in the minds of some. God’s design for justice and legal process is noble and holy. It is worth thinking about how to ensure that what the courts do and how they do it is protected from processes that demean the court and turn it into a weapon, rather than a blessing in our societies. But we are just scratching the surface and prompting some ideas into the open. Let’s see where this leads us in time. I have been blessed by having little to do with courts and legal action over the years. However, I have recently realised that as a Christian minister providing support to many and varied people I need to think through some of the issues relevant to legalities and court processes. I expect that in the years ahead I will assist people facing legal cases they have been dragged into. Many of those people will be ignorant of legal process and the issues involved, just has I have been. The thoughts outlined here are just ramblings of someone coming to terms with practical, scriptural and personal issues that might impact people who are taken to court, even by their former friends, family or others. Christ and the Holy Scriptures instruct us to be in honour with all, live peaceably with them, agree with them, let our Yea be Yea, love our enemies, be like God who sends rain on the just and the unjust, etc. From what I see in the Scriptures, when someone has an issue with me they have the problem and issue, not me. They have something to resolve internally, which may involve external events. If they think I owe them a debt, then their concern or issue can be resolved by a simple accounting entry, to write off the debt, sell the debt, forgive the debt, turn the sale into a gift, etc. This isn’t to say that I want to do wrong and get off without accountability, but often a perceived debt or offence is not real. The person who feels offended, cheated, taken advantage of or otherwise wronged may not have been wronged at all. Have you noticed that in legal wrangles both parties end up deeply aggrieved with the other. The whole situation becomes adversarial, painful and offensive. Some people press claims that are not founded on reality, yet they get deeply enmeshed in all the pain and agitation of that case, despite their own error in perceiving fault where it does not exist. When people operate out of a context of grace all the tension and wrangling which springs from the anxieties of a person with wrong thinking are dissolved and everyone is happier for it. Picking up the command of Christ that we love our enemies and bless those who curse us we see that Christians are to be a blessing and to look to help others, such as by being a resource, one who gives value to others (a creditor), or a prosperous one who is a blessing to all the families of the earth. Most people do not see themselves as a source of blessing and do not seek the context in which they can be a blessing. Instead they are led to believe that if someone else wins, they must have lost. They do not seek win-win, but win-lose contexts, and they fear being at the losing end. This win-lose hardness of heart attitude leads some contentions people to prefer that everyone loses rather than being the loser themselves. They cannot suffer loss, give grace, forgive the offender, or have a generous spirit toward others. In some cases people have been known to destroy something rather than allow their adversary to have it, even though it lawfully belongs to the other person. Before anyone gets to court there are heart issues that come to the fore. Anger, offence, resentment, unforgiveness, jealousy, hardness of heart, contempt, and similar adversarial attitudes tend to lead people to court, either to press a case or to fight with all their might against an adversary. Consider this challenging question from the Apostle Paul writing to the Greek church in Corinth about their track record of taking one another to court. Initiating legal action means that Christians have chosen to take a hard hearted attitude toward others, rather than accepting the loss and getting on with life. Paul suggests that Christians should accept that they have been wronged by their Christian brothers, forgive and get on with life, rather than taking the matter to court. I am not giving any advice here. I am simply raking over some things the Bible says about going to court and pressing legal cases. I am trying to think things through. Maybe you would like to add a comment to this post, with your own observations or questions.